The Science of Team Science [SciTS] Mendeley group features a large library of literature on transdisciplinary research, as well as cross-disciplinary and inter-professional exchange of information and resources. Members can search resources in the database, create subgroups, and add resources and comments. The Team Science Toolkit is a user-generated repository of information and other resources that supports the practice and study of team science. It contains over 1000 resources, including practical tools to support successful team-based research, measures and metrics to evaluate or study team science processes and outcomes, and bibliographic entries. Delivered June 22, 2017 at the University of Memphis, Dr. Spring provides an overview of Team Science, explaining why it is important, the science behind it and its applications. Contractor, N., Wasserman, S., & Faust, K. (2006). Testing multitheoretical, multilevel hypotheses about organizational networks: An analytic framework and empirical example. Academy of Management Review, 31(3), 691-703. A look at various motivations for forming or joining a team and why people are motivated to create certain network links. There are several multi- theoretical motivations to create teams: individual, didactic, triatic, and group, and these can occur at multiple levels. An overview of different coordination costs and their effect on project outcomes in multi-university collaborations. 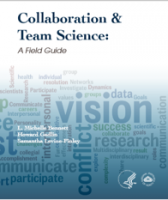 Defines multi-disciplinary team science and ways to successfully achieve it. A description of how teams assemble and form specific collaboration structures and networks. This study examines how teams perform through collaboration. Teamwork in science increasingly spans university boundaries and all fields of science, engineering, and social science, due to a dramatic shift in knowledge production. Shrum, W., Genuth, J., & Chompalov, I. (2007). Structures of scientific collaboration. Cambridge, MA: Massachusetts Institute of Technology Press. Several different ways collaboration may be structured. Stokols, D., Hall, K., Taylor, B., & Moser, R. (2008). The science of team science overview of the field and introduction to the supplement. American Journal of Preventive Medicine, 35(2), S77-S89. First-annual conference examines different ways teams can organize, communicate, and conduct research. Outlines how a significant increase in teams has become dominant in the production of knowledge. The Science of Team Science Listserv provides an open forum for all subscribers to share information relevant to the practice and study of team science. The Integration and Implementation Insights blog (also known as I2Insights) is a community weblog for researchers who are interested in Team Science and its use to facilitate understanding and acting on complex real-world problems. The blog is run by the Integration and Implementation Sciences team at The Australian National University. Intereach (Interdisciplinary Integration Research Careers Hub) community brings together practitioners and researchers of interdisciplinary integration - people who connect across teams, disciplines, and sectors to solve problems requiring diverse expertise. Great space to share best practices, success metrics, and ideas for establishing intereach career paths. NIH Biomedical Citizen Science Hub (CitSciBio) is a virtual collaboration space designed to help anyone interested in biomedical citizen science and crowdsourcing discover and contribute resources, form collaborative groups, and share expertise. Savage N. How team science extends your scope. Nature. 2018;556(7700):S1-S3. Lauer M. Impact of Teams Receiving NIH Funding. Open Mike. Vol 2018.https://nexus.od.nih.gov/all/category/blog/ NIH; 2018. Hall KL, Vogel AL, Huang GC, et al. The science of team science: A review of the empirical evidence and research gaps on collaboration in science. Am Psychol. 2018;73(4):532-548. Fortunato S, Bergstrom CT, Borner K, et al. Science of science. Science. 2018;359(6379). Fiore SM. The Strength in Numbers The New Science of Team Science. Science. 2018;359(6376):645-645. Al-Suqri MN. Promoting interdisciplinarity in knowledge generation and problem solving. Hershey, PA: Information Science Reference; 2018. Saunders P. Supporting researchers in an era of team science. Lancet. 2017;389 Suppl 1:S10-S12. Little MM, St Hill CA, Ware KB, et al. Team science as interprofessional collaborative research practice: a systematic review of the science of team science literature. J Investig Med. 2017;65(1):15-22. Klein JT, Falk-Krzesinski HJ. Interdisciplinary and collaborative work: Framing promotion and tenure practices and policies. Res Policy. 2017;46(6):1055-1061. Fontanarosa P, Bauchner H, Flanagin A. Authorship and Team Science. Jama-J Am Med Assoc. 2017;318(24):2433-2437. DeHart D. Team science: A qualitative study of benefits, challenges, and lessons learned. Soc Sci J. 2017;54(4):458-467. Innovative assessment of collaboration. New York, NY: Springer Berlin Heidelberg; 2017. Zeng XHT, Duch J, Sales-Pardo M, et al. Differences in Collaboration Patterns across Discipline, Career Stage, and Gender. Plos Biol. 2016;14(11). Menken S, Keestra M. An Introduction to Interdisciplinary Research Theory and Practice Discussion and conclusion(s). Introduction to Interdisciplinary Research: Theory and Practice. 2016:96-100. Leahey E. From Sole Investigator to Team Scientist: Trends in the Practice and Study of Research Collaboration. Annu Rev Sociol. 2016;42:81-100. Van Noorden R. Interdisciplinary Research by the Numbers. Nature. 2015;525(7569):306-307. National Research Council (U.S.). Committee on the Science of Team Science., Cooke NJ, Hilton ML, National Research Council (U.S.). Board on Behavioral Cognitive and Sensory Sciences, National Research Council (U.S.). Division of Behavioral and Social Sciences and Education. Enhancing the effectiveness of team science. Washington, D.C.: The National Academies Press; 2015. Brown RR, Deletic A, Wong TH. Interdisciplinarity: How to catalyse collaboration. Nature. 2015;525(7569):315-317. Bammer G. Interdisciplinarity: Less vague please. Nature. 2015;526(7574):506.